Most of us know the British Forces Broadcasting Service only through the recent Gulf broadcasts. But the history of BFBS would take you to many very interesting places. The 1944 card at the top is from the early FBS HQ station, JCJC, in Cairo, Egypt. The middle card is from the East Africa Command station in Nairobi, Kenya which broadcast on 7265 kHz. with 250 watts. And at the bottom is the generic card used by the various FBS Middle East Land Forces stations in the 50's, this one verifying reception of FBS Benghazi. 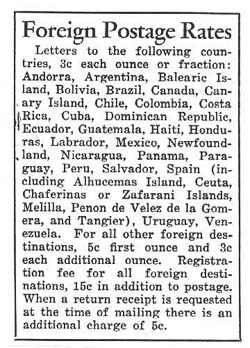 Ever wonder what the foreign postage rates were in, say, 1934? Read below and weep.